Crystal clear 2" wide tape is a durable, multi-purpose packaging tape keeps your mailers secure and packages tight. Edging is not sticky so it doesn't stick to everything around which is great. At first I was disappointed. I thought it looked and felt very cheap and flimsy. Then I used it was its lightweight and sticks perfectly. 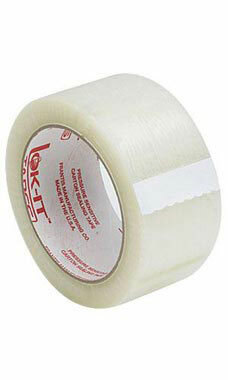 Spend more time trying to start tape off the roll again and again after it broke or split off. Brought six rolls and after the first roll threw the rest away and went and bought some at Wal-Mart which was a few cents more but was much much better tape!!! Holds great, doesn't separate. Shipping excellent. Service excellent. Decent price for low quantities. I'm glad that I don't have to order a case at a time! I ship a lot of things so I go through a ton of tape. This is the best price I've found where the tape is actually still good quality and usable. Great for the price, but it's definitely cheap and thin. My order left me with some free space to fill for my order, so I decided to throw a few packaging tapes into my order since I am paying for shipping anyways. My dollar store has the most crappiest quality, and these tapes costs around that same price but works 100x better, if you got room in your shipment, add them, they are worth it. I wouldn't recommend for commercial use but great for everyday shipping of small boxes. Great price compared to what I have paid for in stores for packing tape. Fast delivery! Fabulous price! Saving us lots on shipping supplies - will be ordering our supplies from here from now on! Overall excellent experience! Shipping was super Fast and all there items are not expensive. Plus they have everything you can think of for operating your business. Great quality items. This pack of tape is alot cheaper that what we have been paying. We are frequent users of packing tape in our business. This was our first time ordering it through Store Supply Warehouse. As always the order process is simple and delivery is very quick and error-free.